Loved this post! One of your best so far, methinks. My only question is, who “lives” in the bottom-left quadrant? Answer to Brinestone’s question: The language of the future! Only somewhat kidding. I’d venture to suggest that what determines the axis one falls on has to do with whether one believes language to be a living thing or merely a relic of a civilization. And in that context, I’d defend those linguists who feel there is something deeply wrong with extreme prescriptivists whose attitudes see no difference between English and a dead language like Latin. In fact, they want English to be more like Latin, they want it to be dead. Well, that’s just my two turtleddoves. Jonathan, the quadrant makes much more sense than the continuum. I see copyeditors occupying various places in the upper right quadrant, though sometimes they slip over into the upper left quadrant and become assertionists. Excellent, thoughtful, and thought-provoking post. In that lower-left quadrant, I would place those people who have for years insisted that English is and should only be a Germanic language, and that English speakers should strike from their vocabularies any words with a Latin or Greek base. (Unfortunately, I’m at a complete loss of the name of this movement at the moment.) The composer Percy Grainger was one of these types; he would use, for example, “louden” and “soften” instead of the Italian “crescendo” and “decrescendo” in his music. People like this neither tell you how people use language nor tell you how to write well. I’d probably also put those people who push for simplified, phonetic spellings of English words. But you don’t want to get me started on that idiocy. After a little more research, it seems, perhaps, that “movement” might be a little too broad for Percy Grainger’s linguistic beliefs. His choices were rooted in racism and bigotry, and he seems not to have had too many followers . . . unless you count the Third Reich. We’re using the wrong term. It’s not prescriptionist, but proscriptionist.If you think about it, every so-called prescriptionist or assertionist, acts like Moses coming down from the mountain. Thou shalt not end a sentence with a preposition! Give me a break! Percy Grainger advocated what he called ‘blue-eyed English’. There are still folk about who’d like to say ‘Crosslikening speechlore’, instead of ‘comparative linguistics’. I’m not sure anyone exists in the lower-left corner. Perhaps people who make proscriptions against usages that don’t exist to begin with. Erin: The thought of making some sort of profiler or linguistic temperament sorter crossed my mind, but I don’t have time for it right now. Maybe I’ll try to tackle that when I’m finally finished with my thesis and have a little more free time. Andy: Thanks! I think I’d still put those types in the upper-left corner; they’re still saying that English should be something that it’s not, much like the assertionists. But the motivations are not exactly the same. Marc: I thought about diving into the difference between prescriptions and proscriptions but decided against it. Maybe I should have, because it may be a better way to characterize the axis that I’ve labeled “prescriptivism”. Maybe the top should be “what language should be” (prescriptions) while the bottom should be “what language shouldn’t be” (proscriptions). 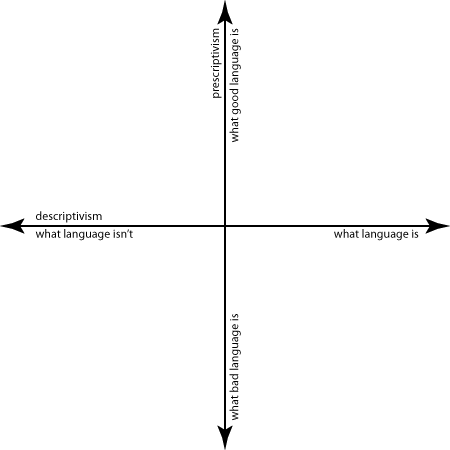 So a lot of what we think of as prescriptions are really proscriptions like “don’t end a sentence with a preposition” or “don’t use disinterested to mean uninterested“, even though those rules often run counter actual usage, placing them in the lower-right quadrant. The problem is that it’s not entirely clear what the goal of prescriptivism is. As I discussed in this earlier post, prescriptivism isn’t really a coherent principle but a set of often-conflicting goals, so it’s hard to boil it down to one characteristic. I’m afraid I don’t understand why you think Hall’s argument is duplicitous. What is a truth value, and what does it have to do with prescriptivism? I mean, it seems to me that Hall is talking about untrue statements that we see in prescriptivist writing: disinterested does not mean uninterested, it is wrong to end a sentence with a preposition, good writers don’t use “which” restrictively, etc. A truth value is “a value indicating the relation of a proposition to truth”, according to Wikipedia. Linguistic descriptions are essentially propositions: the language is x. For example, “Many people use disinterested to mean the same thing as uninterested.” You can verify whether or not it’s true. A prescription, on the other hand, says the language should be y. “Don’t use disinterested to mean uninterested” or “Disinterested should not be used to mean uninterested.” This kind of statement can’t be assigned a truth value, because it’s not a statement about what’s true or untrue. I think it’s duplicitous to call an opinion an untruth, because opinion is not the opposite of truth. He’s essentially doing what some prescriptivists do when they say “x is not a word”—he doesn’t like prescriptivism, so he simply says it’s false. Surely the prescriptivist position is not “Disinterested should not be used to mean uninterested”, but “disinterested cannot be used to mean uninterested”, which is indeed a falsifiable statement. Why would you say that? Some prescriptions may be stated in such terms, but I’d say most aren’t. For example, here’s Garner: “The distinction is still best recognized and followed because disinterested captures a nuance that no other word quite does.” Later he notes that “disinterested is frequently used (or, in traditionalists’ eyes, misused) for uninterested“. And even when prescriptivists make statements like “disinterested cannot be used to mean uninterested“, it’s clear that they mean this in a deontic sense. When challenged and presented with evidence that it can be used that way, prescriptivists generally admit that it can, but it shouldn’t. Thus prescriptivism is really concerned with what should be rather than what is. I love this. Thanks for writing it — such an important topic. But it seems to me that your graph falls a bit short in that it provides a space for a value judgment on “bad” prescriptivists, but no corresponding space for “bad” descriptivists. Can’t descriptivism go too far? I think so, but I also think it bugs when descriptivists scream and shout about prescriptivists and their plodding, plodding pedantry. The reality is that these two supposedly contradictory philosophies can live quite comfortably inside one linguist. And should, I think. The graph really isn’t about good or bad descriptivists or prescriptivists, but rather about two different areas of inquiry—what’s grammatical and ungrammatical (in the linguistic sense), and what’s correct and incorrect. It’s certainly possible for descriptivists to get it wrong—to say something’s ungrammatical when it’s not, for example—but I’m not sure what you mean by “go too far.” Could you elaborate? This is a very insightful and thought-provoking post, indeed! Now, I’m seeing a coordinate system in language, something that I’ve usually associated with math. The comments have discussed might fall into the quadrants, but I’m more interested in who might be standing at that point of intersection. Taking the value of that position as zero, does that mean that this individual does not care about truth and order? I see that this is a plausible model to reconcile that P vs. D dichotomy, so this next point is all about application. How else can we use the quadrants and the lines? I’m thinking along the lines of the Johari Window. Like I said, it’s thought-provoking. Thanks, Chad, and I’m sorry I forgot about your comment until now. I’m not sure it makes sense to think of it as a coordinate system. That is, I don’t really know what it would mean to stand exactly at 0,0. I probably should have described it as a set of quadrants—with two sets of nongradeable binaries—rather than a plane. I don’t think your is/isn’t and should/shouldn’t oppositions really do anything, because you can always formulate one as the other. If subjects should agree with verbs in number, then they shouldn’t be discrepant. If I believe that infinate is a standard spelling, then I don’t know what the standard spelling actually is. Perhaps a better approach would be to have two positive-only axes, one for knowledge, one for opinion. Then (0,0) is at the lower left, and means a person who is completely ignorant and indifferent about usage. (1, 1) would be someone who knows all about (a) language and has completely rigid opinions about what it should be. I am perhaps (0.7, 0.4) about English, but a perfect (0, 0) about Badyara.